Crude oil by itself isn’t very useful; it derives its value as a commodity from its products. 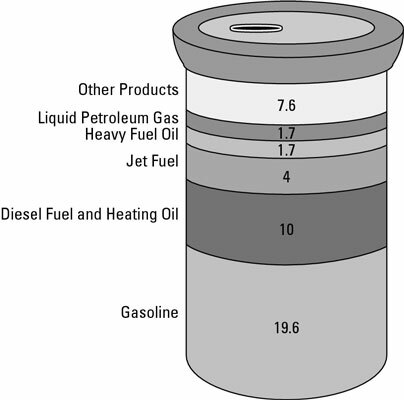 Only after it’s processed and refined into consumable products such as gasoline, propane, and jet fuel does it become so valuable. Crude oil was formed over millions of years from the remains of dead animals and other organisms whose bodies decayed in the earth. Because of a number of geological factors such as sedimentation, these remains were eventually transformed into crude oil deposits. Therefore, crude oil is literally a fossil fuel — a fuel derived from fossils. Not all crudes are created equal. If you invest in crude oil, you need to realize right off the bat that crude oil comes in different qualities with different characteristics. You’d be surprised by how different that “black stuff” can be from region to region. Generally, crude oil is classified into two broad categories: light and sweet, and heavy and sour. Other classifications are used, but these are the two major ones. How is this criteria important to you as an investor? First, if you want to invest in the oil industry, you need to know what kind of oil you’re going to get for your money. If you’re going to invest in an oil company, you need to be able to determine which type of crude it’s processing. You can find this information in the company’s annual or quarterly reports. A company involved in producing light, sweet crude will generate more revenue from this premium crude than one involved in processing heavy, sour crude. This distinction doesn’t mean that you shouldn’t invest in companies with exposure to heavy, sour crude; you just have to factor the type into your investment strategy. As you can see, you can choose from a wide variety of crude oil products as investments. If you’re interested in investing in a specific country, you need to find out what kind of crude oil it produces. Ideally, you want a crude oil with low sulfur content and a high API number as a density benchmark.